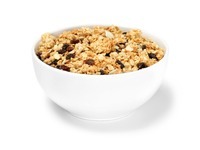 Muesli is traditionally made in Switzerland. However, there's no reason you cannot enjoy our own home made muesli that we oven bake gently with honey, and add tropical fruits to taste. Great for a health breakfast that tastes fantastic. Why not ask our staff to cut in a piece of additional fresh fruit such as a banana?